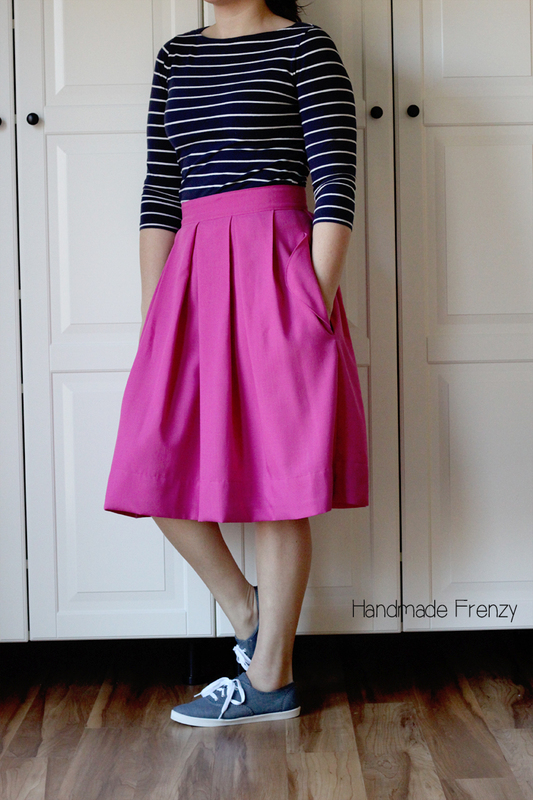 This week I pattern tested again for Kimberly of Straight Stitch Designs. And this, just like the Montlake, is another good one ya'll! 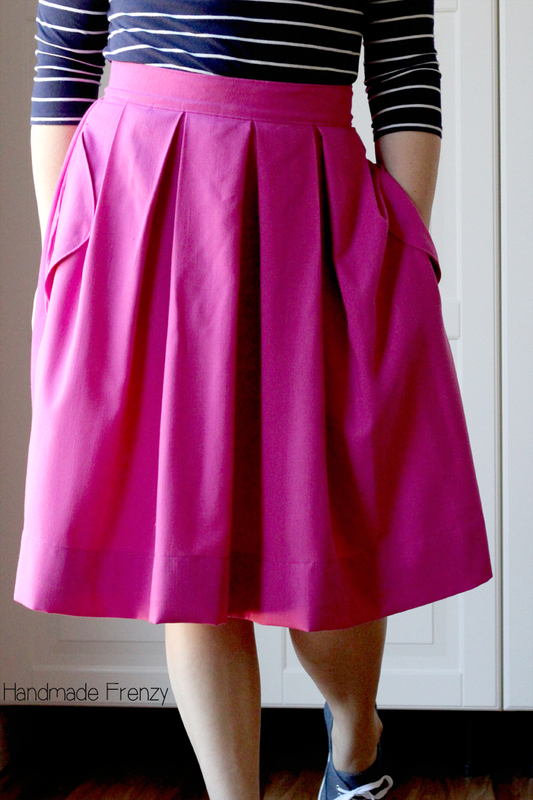 This is the Wedgewood Skirt. 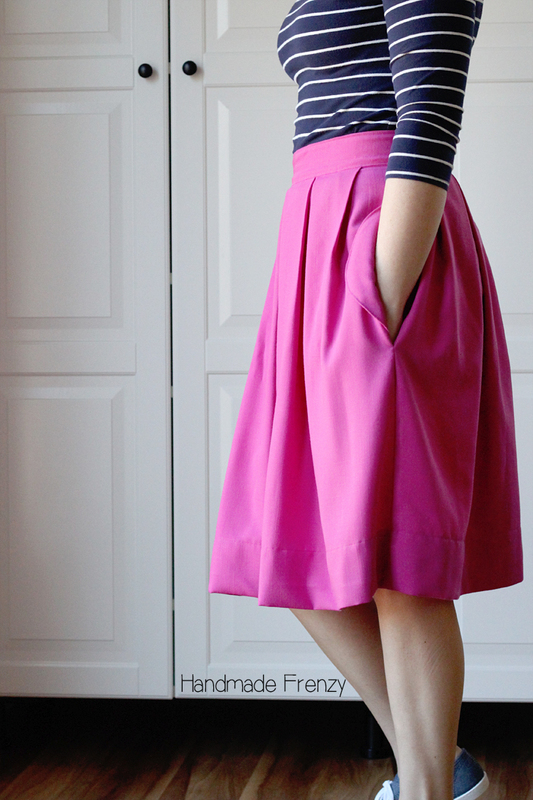 I have been loving the pleated high waisted skirts I've been seeing on Pinterest and was so excited to see that a pattern was coming out that exactly fit my needs (ok, wants...)! 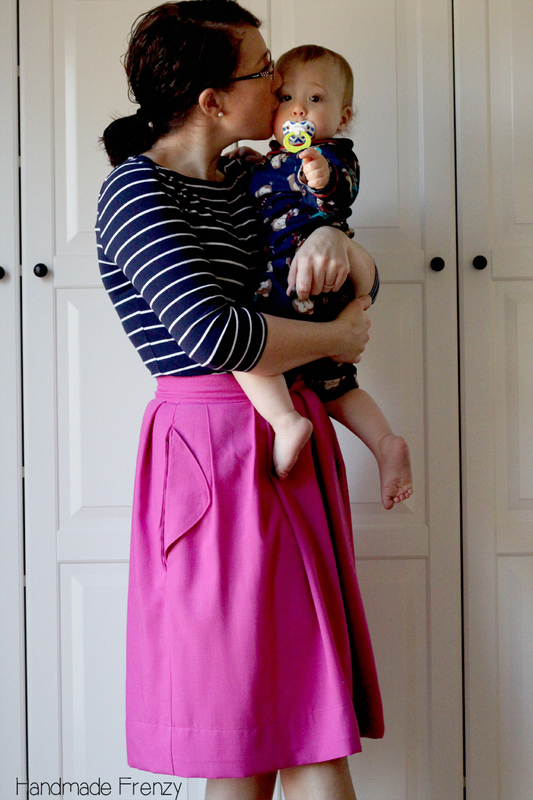 The features of this skirt include: 4 front and back box pleats, pockets and fun oversized pocket flaps (both optional), an exposed zipper and button tab closure, knee or midi length and is intended to sit on your natural waist. This pattern is based off of your waist measurement, hips are not even included in the size chart. My waist measurement put me exactly in a size 8, so that's what I made with no changes whatsoever, and the fit is spot on. 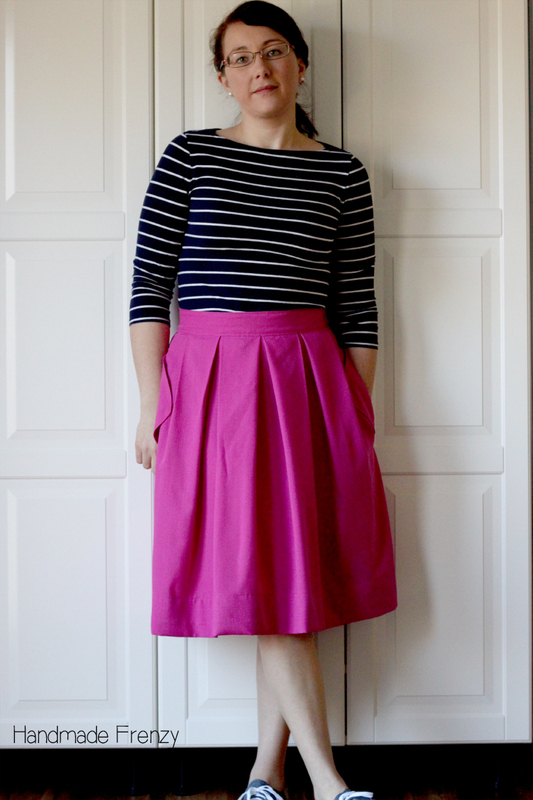 My waist is usually in a size larger on pattern charts than my hips and so with the fullness of this skirt it actually gives the illusion of a figure that I don't necessarily have ;) I count that as a good thing!! For this version I went the mom-casual/sporty route. I wanted a skirt to wear during the week and allow me to be comfy and still look put together. 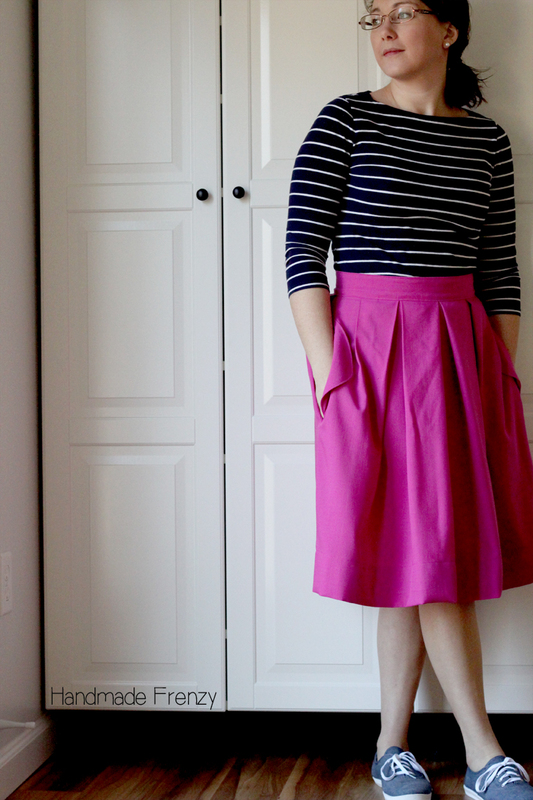 I love that by simply changing up the fabrics, playing with the pockets and length I can have one skirt pattern that will take me from weekday casual to date night and church attire! I have visions of one in a stiffer floral upholstery or jacquard fabric for a formal version, maybe another solid colored one in rayon challis, and maybe a floaty springy version in a floral or abstract printed challis to wear with sandals in the heat of summer. Oh, so many good options!! Can you tell I'm excited to have this pattern in my stash!? The fabric I used for this tester version is from Joann's red tag section, I think I paid $2.50/yd. It was marked as a linen, which I seriously doubted, and right before purchasing I found the fabric content on the bolt and there was definitely no linen. Mostly polyester and a little bit of cotton, but it is soft, flows well and doesn't wrinkle terribly easily (the picture below argues that, but it does wear well! ), so that works for me. 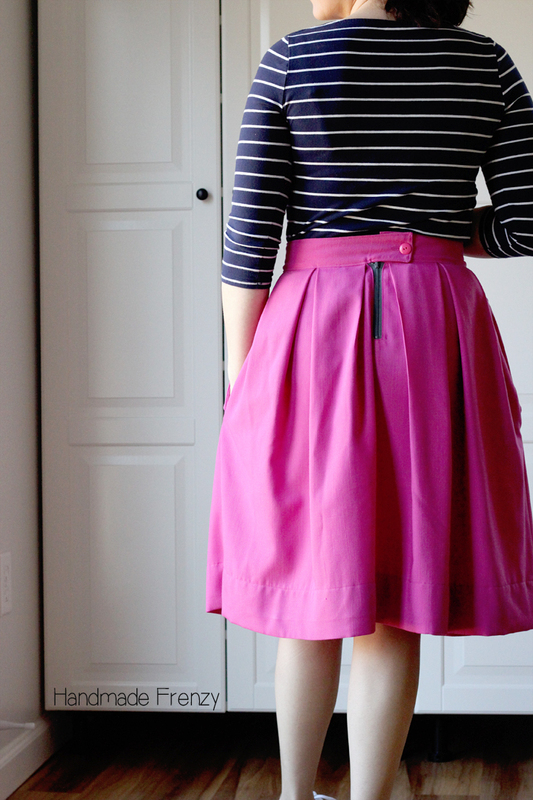 And a skirt for just over $5, works for me too! 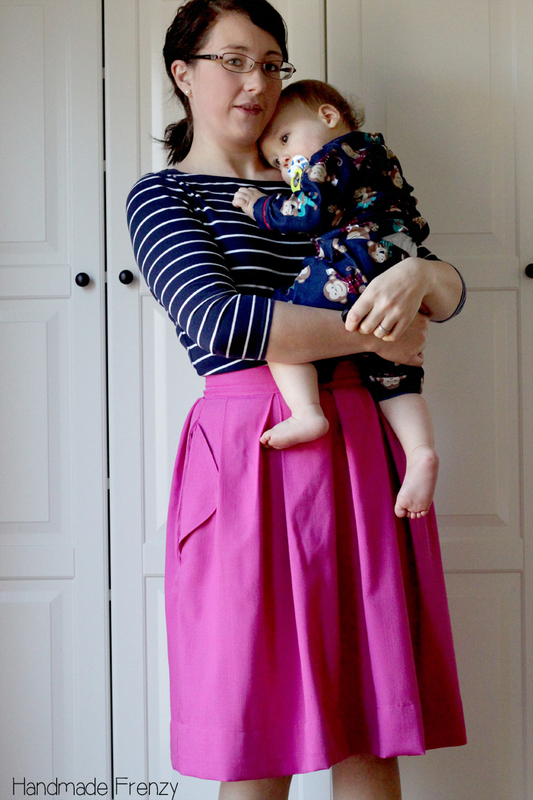 Go here to grab your copy of the Wedgewood Skirt! And if you want to browse some inspiration photos, I have several pinned here. This is so super cute. Casual and yet super stylish. Perfect! Love this and your delicious baby! Great color and fit! I love the color and the shoe pairing. so cute and casual!